It is not yet universally accepted by scientists, but humans and prehistoric animals walked the earth together 275 million years ago. Tex “Butterfingers” Rawlings was rawhide tough and he had to be. Times werenʼt easy in the Permian. The planet kept shaking after the continents merged to become the single great landmass named Pangaea. And it was drought time in north Texas as the climate of Euramerica grew hotter and drier. Swamps disappeared and grass shriveled. But Tex knew what to do. He yelled at the crew in the bunkhouse to follow him to one of the few remaining ponds in the region. The men hid behind boulders and waited. As late afternoon crept over the land, three ferocious Dimetrodon came to drink. Horses hadnʼt evolved yet, so the Texans stood on rocks, swung their lariats, neatly threw the loops over the crittersʼ heads, and pulled. It wasnʼt easy. The large flesh-eaters were three times as heavy as the men, had long teeth and powerful jaws that could tear prey to bits, and a spectacular growth that looked like a sail rising from the back. And they moved quickly. 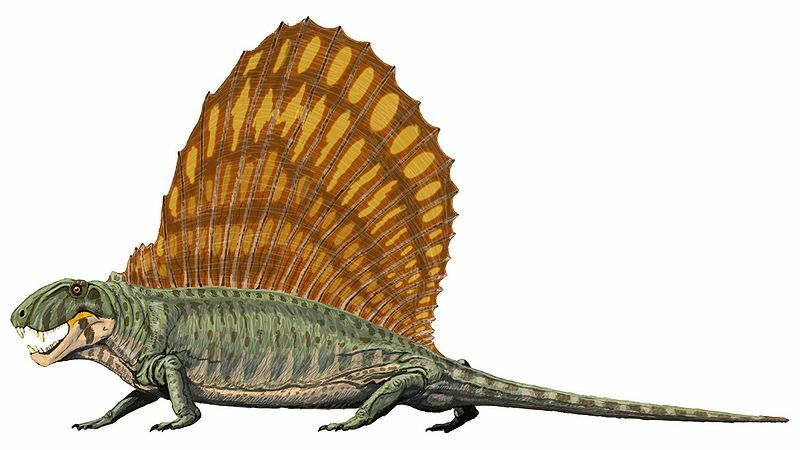 Image of Dimetrodon grandis, courtesy of DiBgd at English Wikipedia. But the Texans were up to the challenge. The large beasts were soon bound tightly and branded. Then it was time for the long Dimetrodon drive to Kansas.